Note: Complete Technical Details can be found at the 2N3904 datasheet given at the end of this page. 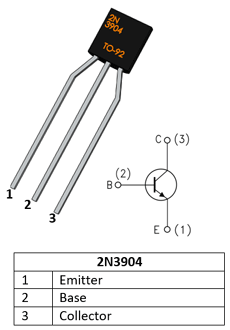 2N3904 is a NPN transistor hence the collector and emitter will be left open (Reverse biased) when the base pin is held at ground and will be closed (Forward biased) when a signal is provided to base pin. 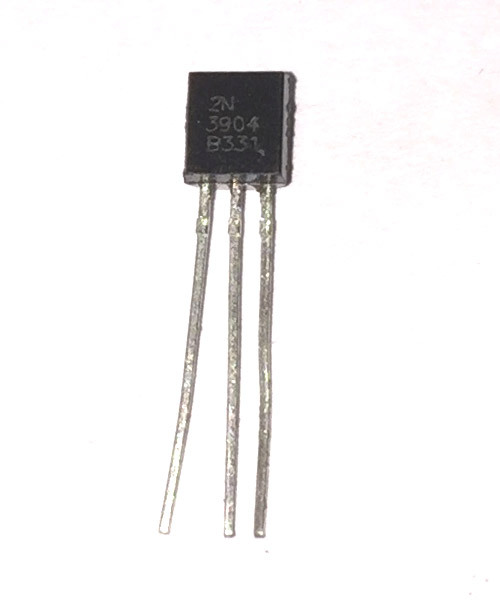 2N3904 has a gain value of 300; this value determines the amplification capacity of the transistor. The maximum amount of current that could flow through the Collector pin is 200mA, hence we cannot connect loads that consume more than 200mA using this transistor. To bias a transistor we have to supply current to base pin, this current (IB) should be limited to 5mA. When a transistor is used as a switch it is operated in the Saturation and Cut-Off Region as explained above. As discussed a transistor will act as an Open switch during Forward Bias and as a closed switch during Reverse Bias, this biasing can be achieved by supplying the required amount of current to the base pin. As mentioned the biasing current should maximum of 5mA. Anything more than 5mA will kill the Transistor; hence a resistor is always added in series with base pin. The value of this resistor (RB) can be calculated using below formulae. Where, the value of VBE should be 5V for 2N3904 and the Base current (IB depends on the Collector current (IC). The value of IB should not exceed mA. A Transistors acts as an Amplifier when operating in Active Region. It can amplify power, voltage and current at different configurations. 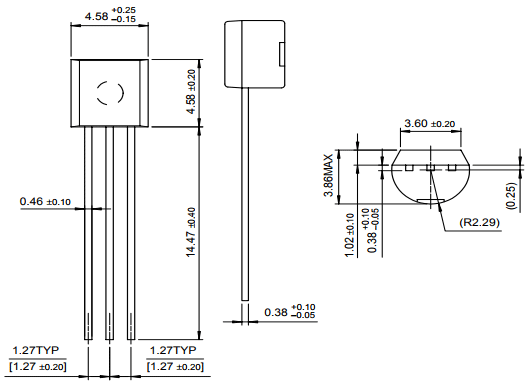 If you are designing a PCB or Perf board with this component then the following picture from the 2N3904 transistor Datasheet will be useful to know its package type and dimensions.